NFL coaches Jim Harbaugh and Mike Tomlin have reportedly said no to any interest in the Texas Longhorns head coaching vacancy. 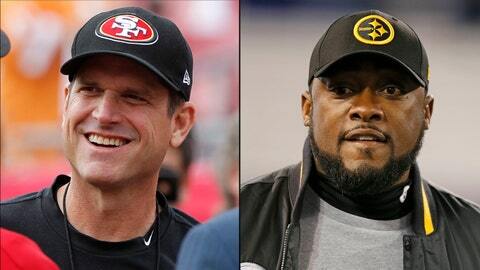 Now San Francisco 49ers coach Jim Harbaugh and Pittsburgh Steelers coach Mike Tomlin appear to have taken their names out of the running for the head coaching position with the University of Texas now that Mack Brown has officially stepped down. NFL Media columnist Michael Silver reported Sunday that Harbaugh has told the front office that he is staying put while fellow insider Ian Rapoport reported that a source told him that Tomlin is a no-go as well. Of course everything is gossip and rumors at this point. Earlier in the week, Harbaugh seemed caught off guard when a reported asked about his name being thrown into the mix. "Are you trying to be funny?" he said. "I don’t ever talk about any job other than the one I have." Even former Longhorn quarterback and current 49ers backup Colt McCoy agreed. "I don’t see that there’s any way," when asked if Harbaugh can make the jump back into the college game. Mike Tomlin also thought the rumors of him leaving Steele City were "absurd" according to Rapoport. Tomlin went on to say Sunday that he prefers the NFL over the NCAA when he met with reporters Sunday, though he didn’t address any specific rumors. "I always had a desire to compete in this sport at the highest level," he said. "But you don’t know if those opportunities are going to be presented to you. I think that once you’re exposed to football at this level, you realize there’s only one bowl game â the Super Bowl. The rest of that stuff is nice trips and sweatsuits and watches." So, with them off the list, back to Nick Saban?